Friar's Bottom, a crumbling public school, is holding its annual open day. As the motley collection of teachers prepare themselves to meet the parents it is discovered that the valuable "Friar�s Trophy" has gone missing. The school is owned by Trundle and Gertrude Blathercock who are secretly planning to sell the site to an American property developer. Getting wind of their intentions, some of the staff hatch a plan to save the school with help from the Rev Pottington Willis. Meanwhile, dodgy bookmaker Checkers Swindell is hanging around attempting to retrieve gambling debts from Timperney Snout, the art teacher. Eventually Inspector Manners arrives to sort out exactly what is going on. Welcome to the Guild Players autumn production 2007. We have presented a Christmas pantomime on alternate years since 1993. Unfortunately major works to the church heating system have put the stage, green room and wardrobe out of use for nearly 6 months. Instead we present this stripped back production of a light comedy in a slightly 'pantomime' style. The Archer, East Finchley's community newspaper, printed a review on page 10 of the January 2008 issue. What does a drama group do when building work puts most of their rehearsal and storage space out of action for nearly six months? The Church End-based Guild Players decided the show must go on, but with a break from tradition. So, for the first time since 1993, their winter production was not a pantomime. With the absolute minimum of props and a virtually bare stage, they put on a light comedy "in a slightly pantomime style". For me, the pantomime style was the best part of the evening, and I think it could have been developed more. 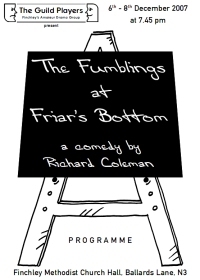 The Fumblings at Friar's Bottom, about a boarding school facing a sell-out to American tycoons, seemed a bit static, but was livened up by a masterly performance from Alan Jobson as Dr Mildew Sponge. Sporting a mortarboard and cane, this character brought audience participation into the proceedings. Treating us as a particularly backward class, he bombarded us with a manic quiz between scenes. Get the answers right, and you got a sweet. Get them wrong, and you wore a dunce's hat. The play itself included some clever little acting cameos, but might have benefited from similar direct contact with the audience. It would have been fun to have some comments from the stage to us. I felt we needed to be drawn into the plot. The Guild Players meet at Finchley Methodist Church, Ballards Lane. Their next production is at the end of April. New members are always welcome, whether as performers or backstage.